On March 22, 2019, Wilma Jean (Ford) Price, beloved mother and grandmother, passed away at the age of 92. Jean was born in Sentinel, Oklahoma in Washita County on December 23, 1926. She was the oldest of five children born to E. Clay and Edith R. (Hammons) Ford. She attended grade school in Cordell and then moved to Norman, Oklahoma in 1940. 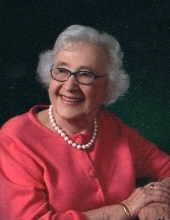 After graduating from Norman High School in 1945 Jean attended the University of Oklahoma, where she received a degree in journalism with an emphasis in advertising and was a member of Gamma Phi Beta. She dreamed of being a career woman in the big city... until she met Calvin King Price. They fell in love and married in 1951. Eventually moving to Sulphur, Oklahoma they opened an insurance agency, following in both their fathers’ footsteps. There Jean and Calvin made their home and started a family, raising two children, Ellen and King. In 2009 Jean moved back to Norman, where she reconnected with old friends and made new ones. Jean was a past member of Shepherd of the Hills Presbyterian Church of Sulphur and an active member St. Michael’s Episcopal of Norman. She was also a member of the women’s philanthropic organization P.E.O. and served on the Sulphur Public Schools Board of Education. Never an idle mind, Jean had many hobbies--especially, golf, bridge, and crossword puzzles!--and she traveled with her family all over the United States and in Mexico and Europe. Jean is survived by three sisters: Maribeth Pate, Judy Schweitzer, Jane Austin, and sister-in-law Judi Barber; children Ellen (Price) Van Osdol and King Price and their spouses Kelvin and Paula; grandchildren Paige (Van Osdol) Banaji and Brian Van Osdol; and three great-grandchildren: Zal, Audrey, and Leo. A beloved aunt, Jean is survived by nine nieces and six nephews: Annie, Janet, Liz, Melanie, Murphy, Emily, Kristie, Kini, Marti, Bill, Lauri, John L., Mark, John A., and Clay. She was preceded in death by her parents, her husband, her brother John, and her nephew Herb. Vivacious, loving, loyal, confident, tenacious, smart, loquacious, and voracious, Jean so greatly touched the lives of all she knew. For ninety-two years she was a strong woman; she will be greatly missed. Donations in Jean’s memory may be made to the St. Michael’s Episcopal Church Memorial Fund. Visitation will be held at the Tribute Memorial Care Event Center from 5:00-7:00 pm on Thursday, March 28th. Services to celebrate her life will be held at 2:00 pm on Friday, March 29th, at St. Michaels Episcopal Church (1601 W. Imhoff Rd, Norman), with interment following at Norman I.O.O.F Cemetery. To plant a tree in memory of Wilma Jean (Ford) Price, please visit our Tribute Store. Jean's family will be present. "Email Address" would like to share the life celebration of Wilma Jean (Ford) Price. Click on the "link" to go to share a favorite memory or leave a condolence message for the family.